The Children's Center - Michelle Vo, M.D. Michelle Vo, M.D. is filled with gratitude to return to The Children’s Center in the role of interim medical director. She has been a friend to The Children’s Center since the early days of her medical residency training. 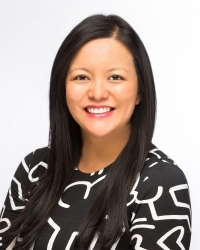 Dr. Vo is a graduate of Case Western Reserve University School of Medicine and completed medical residency training in General Pediatrics, General Psychiatry, and Child and Adolescent Psychiatry at the University of Utah, where she was chief resident. She began seeing patients under supervision at The Children’s Center during her residency and transitioned to a staff child psychiatrist at The Children’s Center in 2013 when she was appointed to the faculty of the University of Utah School of Medicine. She continues to help the medical team transition and enjoys providing consultation to staff and families served by The Children’s Center. Dr. Vo also holds an appointment as Director of Student Wellness for the University of Utah School of Medicine, and is the early childhood psychiatry consultant for the Utah Psychotropic Oversight Program for children in state custody. Dr. Vo is Triple Board-certified in General Pediatrics, General Psychiatry, and Child and Adolescent Psychiatry. She is passionate about working on teams to foster resilience in individuals, families, and communities. Outside her practice, you will find her exploring the great outdoors with her family and her dog, or hosting friends for a theme party and home-cooked meal.